Given the 8-month long crypto bear market, lots of bitcoin naysayers are feeling smug right about now. From JPMorgan CEO Jamie Dimon to CNBC’s Mad Money host Jim Cramer and Nobel economist Robert Shiller, every media personality seems to think bitcoin’s downward trend will continue. There’s plenty of evidence to suggest things will turnaround, but that’s beside the point. Bitcoin in particular and the larger crypto-market in general are already substantial parts of the global economy. This graph is a follow-up from a similar visualization over a year ago, giving us a unique lens through which to make several different comparisons. Let’s start by moving from right to left. All of the world’s bitcoin is now worth more than the personal fortune of Bill Gates, and nearly the same as Jeff Bezos. But look at the combined total value of all the cryptocurrencies in the world—an eye popping $202B. That’s more than double the market cap of Goldman Sachs, no matter what the company’s CEO Lloyd Blankfein would have us believe. Bitcoin’s total market capitalization has more than doubled from $41B to $112B in the past year. More to the point, lots of attention has been paid in the media to cryptocurrency market manipulation and successful hacks. But here’s the rub: downturns are nothing new in the crypto world, as our other research has reported. In short, the value of cryptocurrencies floats up and crashes down, but at least over the last year and half, bitcoin has still seen a substantial net gain in value. The entire market cap of Amazon is $858B bigger than bitcoin ($970B vs. $112B). The first trillion-dollar company, Apple, is worth $888B more than bitcoin ($1T vs. $112B). The value of the entire world’s gold is over 70x more than bitcoin ($7.8T vs. $112B). All of the cryptocurrencies in existence are worth 0.59% of the world’s physical money ($34.4T vs. $202B). Cryptocurrencies are even tinier compared to the world’s stock markets at just 0.30% ($67.5T vs. $202B). And here’s the ultimate comparison: cryptocurrencies are the equivalent of only 0.23% of all the money in the world, broadly defined ($86.5T vs. $202B). Here’s some additional context for these comparisons. Both Amazon and Apple are worth much more than the entire GDP of Turkey ($851B). And here’s the most interesting thing—even as Amazon has amassed such an enormous value ($970B), Jeff Bezos has personally received the equivalent of 10% (or $112B). Add Apple and Amazon together, and you’d have a conglomerate worth more than the entire value of USD in circulation ($1.5T). Is your head starting to spin yet? What if you tried to imagine the vale of the entire world’s gold ($7.8T)? That’s roughly 8 times the value of Apple, or like having the fortune worth 70 times that of Jeff Bezos. 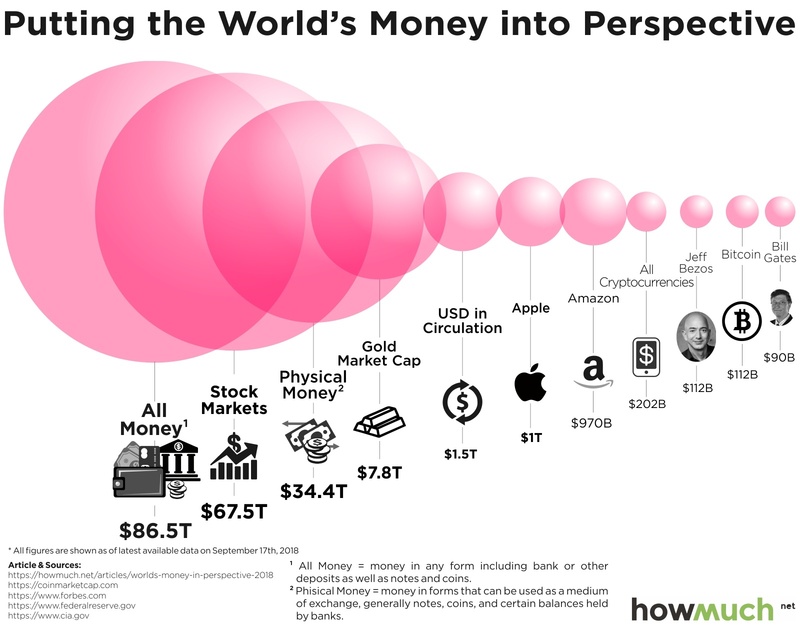 It’s also hard to imagine all the world’s physical money ($34.4T), defined as anything that can be used as a medium of exchange in the world. That’s separate and distinct from all the stock markets’ value ($67.5T), much less the theoretical value of money in the world ($86.5T), which include the funds people keep in their bank accounts. That means if every single person wanted to physically hold all their wealth, governments would need to physically print well more than double the entire monetary value they currently have in circulation.